A doctor, astronomer, editor, poet and psychical researcher, Watson was born in 1859 in Dixie, Ontario, and died in 1926 at Toronto. Although he was known throughout Canada for his poetry and other writing, Watson’s publications relating to psychical research garnered even more attention. From 1918-20 he participated in ouija board sessions for the communication of spirit messages, then recounted those messages in The Twentieth Plane: A Psychic Revelation (1918) and Birth Through Death: The Ethics of the Twentieth Plane; A Revelation Received Through the Psychic Consciousness of Louis Benjamin (1920). For more information, view this pdf. Photograph Courtesy of Mrs. Frances Aselstyne. 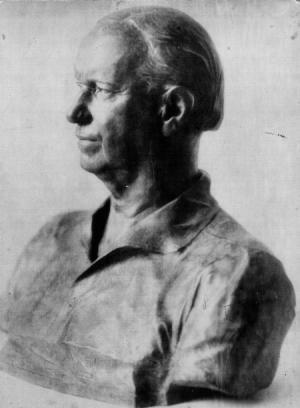 This photograph depicts a sculpture of Dr. Watson created by his wife Sarah Anne Grimshaw (Clare) Watson in the early 1920s.